I love this dish because it’s so quick to make, so fresh, and I am a sucker for fresh basil (and lots of cheese)! Cook your pasta until al dente. Put your cubed mozzarella into the freezer (a trick so it doesn’t melt so fast in the dish). In a large sauce pot add your oil and crank the heat up to high. Wait until the oil is really hot and add your zucchini, do not stir as you want the vegetable to get a bit golden brown. After a few minutes add some salt, pepper, and the garlic and stir. Again wait a few minutes to get the other side golden brown. 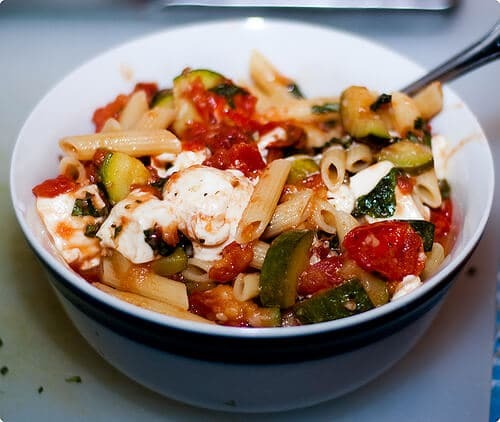 Once the zucchini is golden, add all of your tomatoes, oregano, salt and pepper, and Parmesan cheese. Cook for around 10 minutes, add your basil, and cook an additional 3 minutes. Toss with your penne, add the cubed mozzarella cheese and let sit for 2-5 minutes. Serve with garlic bread if you have it. Oh good lord that looks delicious. You just made my stomach rumble.. audibly. lol Not a fan of zucchini so likely just substitute something like hmm.. mushrooms. nom. Love those. Sarah! That looks so yummy! We do a recipe much like this except it also has chicken and we add some light zesty italian salad dressing from Kraft. It is SO GOOD. In fact, seeing this is making me REALLY crave it. Expect to see pictures of our version along with its recipe soon! @Keeshia why are you not a fan of zucchini? Mushroom wouldn’t work out as it’s much too earthy for this dish. Perhaps eggplant would work as a replacement! @Lynda oh that sounds SO good with the chicken and the Italian dressing!! I will have to do that next time for sure! I also can not WAIT to see you blog about it! Love this dish! It’s so tasty. Zucchini was made for pasta! @Maya I couldn’t agree more! Oh, that just looks delicious! I *LOVE* Zucchini! I think I could eat it everyday. I’m always looking for new recipes to try it in. Just printed this out to try this weekend. Thanks!